Wrexham climbed to top of the National League table with a 2-0 win against Boreham Wood at Meadow Park. 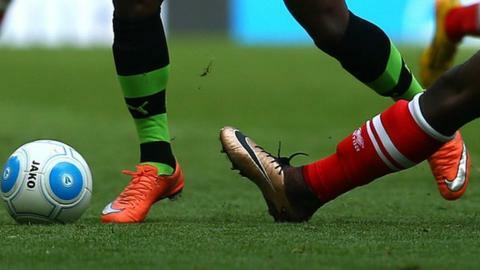 It was a fourth successive victory for Wrexham, who were indebted to two second-half goals from Ben Tollitt, who is on loan from Tranmere Rovers. Wrexham are flourishing under new manager Bryan Hughes and leapfrogged Solihull Moors to top the table. Boreham Wood have yet to register a win this year and remain 15th in the National League. Wrexham provided more than a third of the attendance of 645 with 243 travelling fans making the trip. Wrexham manager Bryan Hughes said: "It was not a fantastic performance by us but we did what we needed to do. "These players deserve all the credit, I am just guiding them in the right direction. We are top of the league with 12 games to go and we will just enjoy it." Match ends, Boreham Wood 0, Wrexham 2. Second Half ends, Boreham Wood 0, Wrexham 2. Substitution, Wrexham. Chris Holroyd replaces Ben Tollitt. Substitution, Wrexham. Cole Stockton replaces Jason Oswell. Substitution, Boreham Wood. Bradley Ash replaces Ricky Shakes. Goal! Boreham Wood 0, Wrexham 2. Ben Tollitt (Wrexham). Jake Lawlor (Wrexham) is shown the yellow card. Substitution, Boreham Wood. Justin Shaibu replaces Ralston Gabriel. Brad Walker (Wrexham) is shown the yellow card. Goal! Boreham Wood 0, Wrexham 1. Ben Tollitt (Wrexham). Second Half begins Boreham Wood 0, Wrexham 0. First Half ends, Boreham Wood 0, Wrexham 0. Manny Parry (Boreham Wood) is shown the yellow card.